This site is provided for the passing of information. The use of this information may void your radios warranty, The modification of your radio may make its use illegal. The owners of this page DO NOT warranty any of this information, nor accept any responsibility of how you use its content. 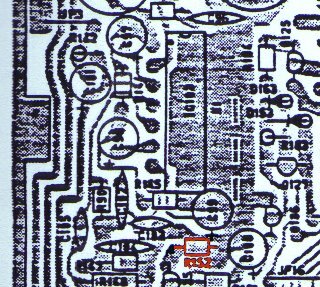 The HR2510 does not have a by-passed emmiter in the audio circuit. To correct this, Add a 4.7uf 16v Electrolytic capacitor across (in Parallel) with R152 (a 560 ohm resistor). This modification will increase the receive audio. This mod will increase the AM reception: Replace the AM Detector diodes (D111 & D112) with better Schottky Barrier diodes. You can use ECG 583 or NTE 583 diodes or 1N6263 or equilvalent. (In the HR2600 the diodes are labelled D11 & D12). This mod will increase receive strength and dynamic range, resulting in louder, cleaner signals while actually reducing noise levels. All you need to do is to replace the existing IF Amp transistor with a new one which has greater frequency response and lower noise characteristics. Once installed you will need to adjust your “S” meter for more realistic readings. 1.) Remove diode D101(see note 2) and remove Transistor Q101, Q1 in the HR2600. 2.) Replace Q101 with a ECG or NTE 23(see note 1), Q1 in the HR2600. Note 1: The new transistor has a different pin out from the original. You will need to reorient the new transistor to work. With the flat side of the transistor facing you and leads pointing down : Existing leads of Q101 = 1 2 3 , the replacement ECG or NTE, you will need to cross the first lead to the last = 2 3 1 . 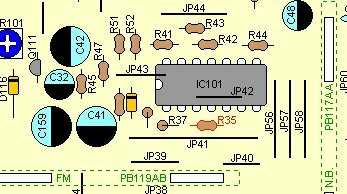 Note 2: 'D101 removal' Comment from J. Shorney(and others) "this diode provides AGC control to the front end, and would seem to leave the radio more susceptible to front end overload if removed." The suggestion would be to leave D101 intact. To Improve the operation of the Mute circuit, remove C137 and R199. These two components are connected to the base of Q117. The Roger Beep in the HR2510 is ‘Unique’ but kind of wimpy..To modify this, locate R96 (a 2.7 Meg. ohm resistor) Remove and replace with a 100K ohm 1/8 watt resistor. This will increase the amplitude of the beep. To change the duration (length) of the beep, replace C110 (10uf 16v ) remove and replace with a capacitor at least 50v with more or less capacitance to lengthen or shorten the beep to your preference. These components are located to the left (facing the front of the radio) of IC 104. To add a needle type meter all you need to do is connect it to C302 on the Microprocessor. Usually this problem is caused by the fact that Uniden did not install an insulator between the MRF477 Final and the heatsink. The mounting tab of the MRF477 (and MRF497) is 'Power' Ground and the heatsink is 'Chassi' Ground. Meeting through the final can cause a 'RF ground loop effect' which tends to cause the High SWR issue. The cure is to add an insulator between the Final and heatsink. Be sure to add a thin coat of Thermal Grease to both sides of the insulator. 'Weird Dead Key' problem. These caps are the 38MHz pull off for the final, and have been known to cause this issue. NOTE: The final stays powered even with the radio turned off, and this could cause problems if your radio is prone to the 'Weird Dead Key' problem. This mod fixes the problem of receiver quieting. longer than usual to recover. Replace R35 [100K ohm] resistor with a 33K ohm resistor.